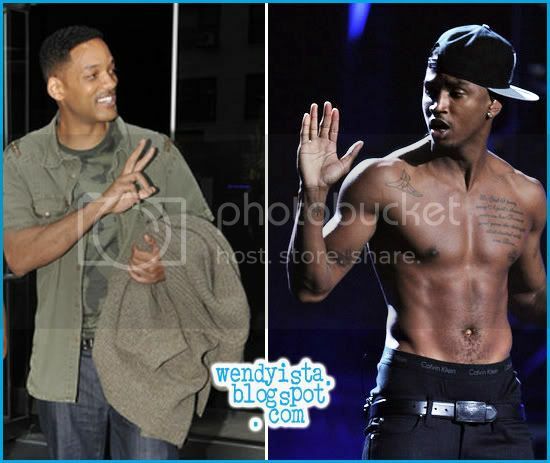 Home » Gossip » How You Doin » Will Smith » Are Will Smith and Trey Songz Secret Gay Lovers? Rumors surrounding R&B heartthrob Trey Songz' sexual orientation have been swirling around the Internets for some time. Last year, it was reported that Trey -- who's allegedly versatile -- dated fellow R&B singer Brandon Hines. Now, word in the skreets is Trey has upgraded -- big time. He's fallen into the arms of Will Smith. Allegedly. Tongues are wagging that Will is enjoying a "bromance" with R&B artist Trey Songz, who's been the subject of gay whispers himself. On Aug. 18, the "Men on Black" star sat at a VIP table with Trey during an event at The Setai's penthouse in Miami's trendy South Beach -- and the two reportedly hooked up again the following evening to enjoy dinner and the local nightlife. For years, Internet bloggers have claimed that Trey had numerous gay relationships with men in the music industry. The 26-year-old Grammy-nominated artist, best known for his album "Ready", had repeatedly denied that he is gay, insisting on an interview: "I love the ladies." Troy Taylor, a record company exec and mentor to the singer told The Enquirer: "I know that Trey and Will have been friends for a very long time, but I can't speak to the nature of their relationship. It's none of my business." ....[A friend of Will adds:] Will stood by Trey's side and watched helplessly as his good friend has been the target of false gay rumors. Now that the shoe is on the other foot, Will has turned to Trey for advice on how to deal with it. Trey told Will to just be true to who he is -- no matter what this is -- and he assured Will the rumors will ultimately pass." We wonder how Duane Martin feels about this. But we digress. Those gay rumors that have followed Will have not passed. In fact, they've gained more traction since Will's 13-year alleged "marriage of convenience" to Jada Pinkett Smith is on the verge of collapse after he reportedly caught her boning singer Marc Anthony. Here's an interesting piece of gossip. Troy Taylor allegedly was pulling a Chris Stokes and "turned out" Trey and Brandon. He was also sleeping with Trey and Brandon. Allegedly. Sidebar: Remember when he visited Wendy's radio show back in 2009 and she asked him a the hypothetical question of a Rihanna and Chris Brown were in a sinking boat, who would he rescue? He said he'll save Chris! HUD! This is indeed false, Trey is Straight and so is Will, plus Will is married to Jada. People need to get a life. Gurl....oooh chal.. As they say "where there's smoke, there's fire"